On Tuesday, March 10, the Health and Human Services Committee voted 5-2 to advance LB 472–Medicaid Redesign for consideration by the whole Unicameral. This will once again be a challenging debate and Nebraskans need their faith leaders to weigh in on this important issue. As of March 12, over 150 Nebraska clergy, women religious and leaders of faith based organizations have signed a Faith Leaders letter asking the Unicameral to support LB 472–Medicaid Redesign Act. OTOC clergy leaders will convene a press conference on Tuesday, March 17 at 12:30 p.m. in the Capitol Rotunda to present the names of these clergy leaders to members of the Unicameral. Bishop Scott Barker, Episcopal Diocese of Nebraska, Bishop Brian Maas, Evangelical Lutheran Church of Nebraska, and Rev. Dan Flanagan, Superintendent of the United Methodist Conference in this region have all signed in support of LB 472.Read More . . . The OTOC Mental Health Action Team asks you to call or e-mail members of the Judiciary Committee to support two bills that would improve the care of prisoners with mental health issues. Judiciary will decide whether to advance those bills after a public hearing that will take place on Friday, Feb. 20 beginning at 1:30 pm in Room 1113 at the Capitol. If you want to attend the hearing, E-mail Sarita Penka at saritapenka2@gmail.com. Prison mental health services reform: This bill ensures that inmates with mental illness receive treatment; evaluation within 2 weeks of admission and evaluation pre-release; track inmates with mental illness post-release, readies commitment proceedings post-release. It also requires notification of local law enforcement before an inmate who is potentially mentally ill and dangerous is released. It also allocates an as-yet unspecified amount of money to improve mental health treatment and re-entry programs for inmates.Read More . 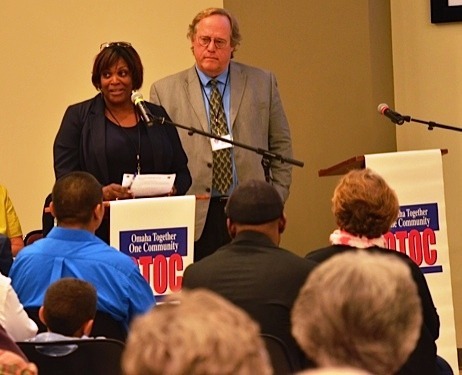 . .
OTOC was selected as Urban Abbey’s non-profit partner during January, 2015. 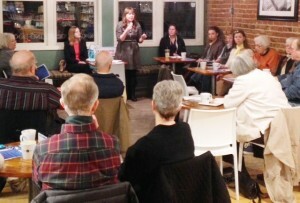 OTOC leaders to organize three “Issue Cafés” to discuss important issues facing Omaha and Nebraska and a fun event celebrating the diversity of our city. Over 160 people attended the issue discussions and the evening of Mexican Bingo (Lotería).Forty five people started the month off with a fun and enjoyable evening playing Mexican Bingo, eating Mexican food and trying out their knowledge of Spanish language and culture. OTOC leaders put aside and focused on the challenging issue of Medicaid Reform on Thursday, January 15. Thirty two OTOC leaders met with Nebraska Appleseed Attorney Molly McCleery to better understand LB 472 which was filed to reform the current Medicaid program to make it more efficient and to cover more working families who need access to affordable health insurance.Read More . . .